We’ve got a new toy in stock just in time for trips to the shore or just to the sandbox outside! Its made in the USA and is all kinds of awesome. 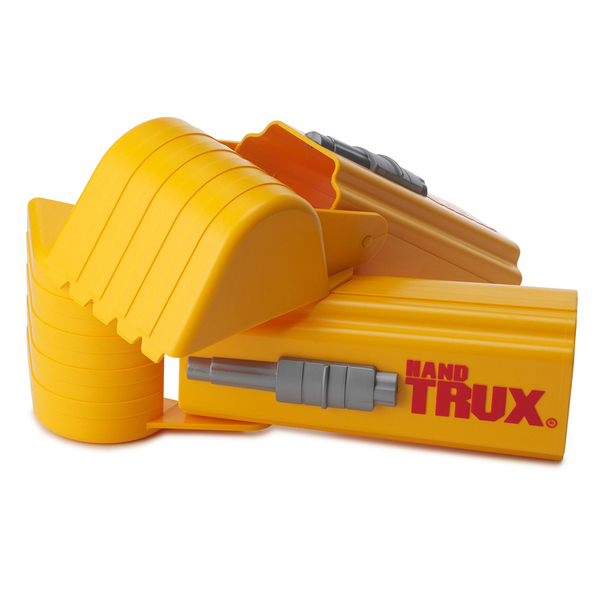 Its the HandTrux! 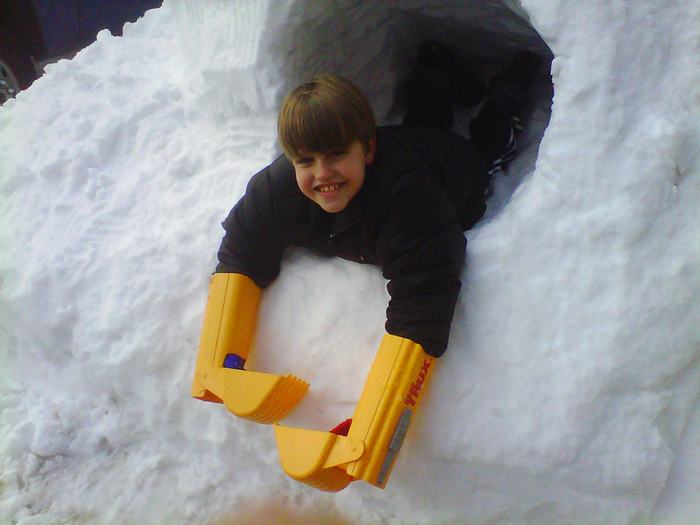 With a simple grip and some durable plastic their hands are now powerful steam shovels that kids can use to dig and shovel! 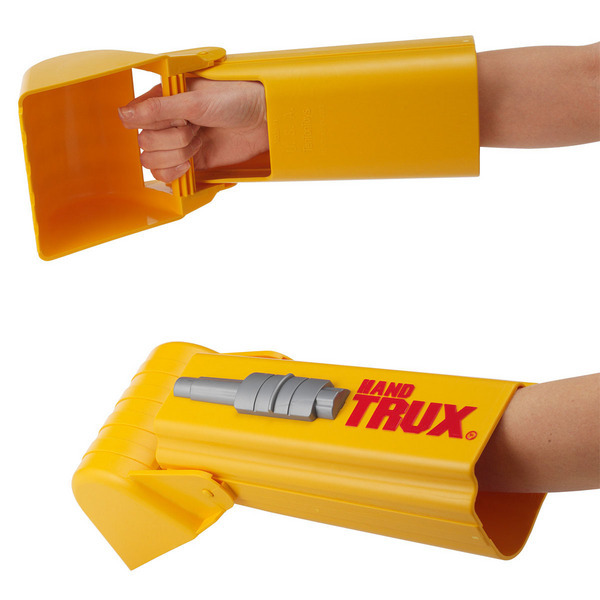 Its not just sand either, snow can be dug through with the Hand Trux as well, making these a year-round toy! 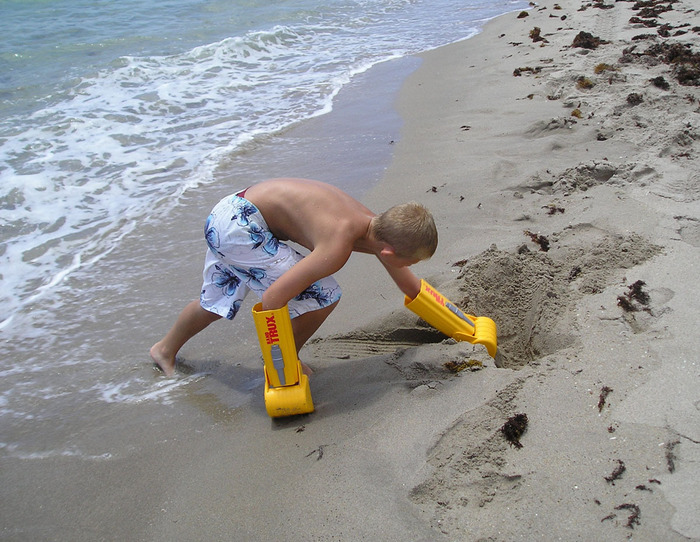 Hand Trux can be used for fun at the beach, in the snow, in sandbox, in the dirt or anywhere kids like to dig! Its an excellent activity toy, made in the USA, and great fun for kids age 5+. Even adults can have fun playing with them (if their arms fit in them, of course). Rainbow Orb – The Video! Its kind of a brain-dead day so we’re just going to keep todays entry simple by showing a video of the 9.5″ Rainbow Orb in action. Don’t forget that we also have the 12″ Rainbow Orb, the 16″ Ultra Rainbow Orb, and the 20″ Ultra Rainbow Orb also available! In the field of biological or medical research, very often microscope slides need to be warmed when they are not in use – either to keep the life in them alive or to make certain certain actions or biochemical processes are taking place. Sometimes it just won’t do to look at a cold, dead slide! For the solution to this problem we have several models of slide warmers that can help in the lab! This has sufficient space to warm quite a collection of slides. With this design the slide ends do not rest on the plate, making for easy retrieval. The stacked formation design also is more efficient and is able to hold twice as many slides as a plate model of the same size. Up to 40 slides can be warmed and the stacking system allows for much greater organization. Oh, don’t forget that we also have been carrying a Microscope Stage Warmer for those who need to have their slides warmed while they are actually being observed! Want to purchase microscope slide & stage warmers? Astronomy Hints #14. Computer-controlled telescopes, or Rise of the Machines! Computers! We love them and hate them. But even when we hate them we know that they make many jobs much easier. So why should astronomy be any different? Well, actually, the answer is that it is and it isn’t. Commercially affordable computerized telescopes have been around for over 15 years at this point, but yet they haven’t become ‘the standard’. Most telescopes sold are still manually operated. Why is that? The answer, is just simple economics.Sometimes it just is not worthwhile to computerize telescopes, especially at the beginner side of things. Let me explain: First of all, a beginner telescope usually costs from $100-$500 (more if you are adventurous). That runs a gambit from a simple but effective 60mm refractor to a higher end 6″ reflector. Without any computers the money is used mostly on the optics with some concentration on the telescope’s mount. You get a pretty good deal if you shop for quality over price. Now, let’s say you want to add a computer to that telescope. Well, here is where it gets sticky. A computer that can do this, with controller, operating motors and other items will cost about $150-$350 retail. On an expensive professional telescope that price is merely an added luxury, but on a beginner telescope you have just doubled the price! Even on the higher scale of beginners telescopes you can be looking at a %50 increase in the price. Adding to that is the fact that most computerized telescopes really do not help beginners very much. Most of them need to be aligned on 2 bright stars – something a new astronomer with little knowledge of the night sky will have trouble doing. Even with tricks like GPS the viewer is still going to have to have some night sky knowledge to work properly. There’s also the problem of power. Larger telescopes with computer motorized systems often draw off of portable 12V batteries to operate. These are not very different from the things AAA workers carry to jump start the dead battery on your car. The extra weight and cost compared to the cost of the telescope is no big deal. But again, on smaller telescopes they try to operate a computer and at least two motors using some D-Cell batteries. These can drain very quickly (especially in cold weather) and some systems give you no options for manual movement once the batteries are drained. Moving some of the models can actually damage the clutches and gears. Now, Celestron has recently introduced a new line of telescopes that actually get around this by using cameras and other functions. 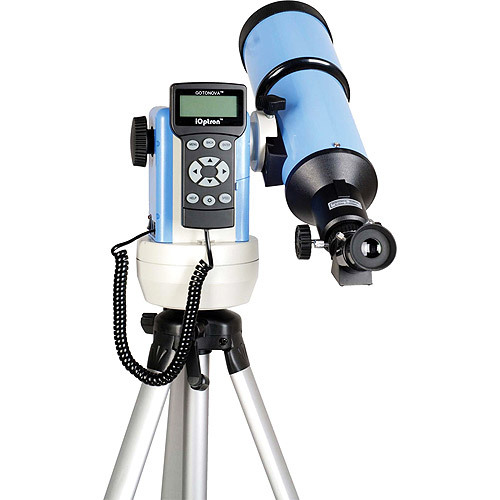 But there is a price: The smallest telescope avaialble with this feature is a 60mm refractor that sells for just under $500! That is five time the price of a comparable non-computerized model. It might be worth it to some folks. 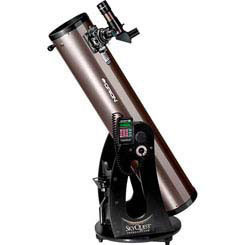 In our experience, the best computerized telescopes for beginners are the non-intrusive models – such as the Orion Intelliscope Dobsonian line. These have computers, but they are not required. In fact we suggest that the new purchaser not use the telescope until they have several sessions under their belt and want to see harder-to-find objects! So unless you plan to shell out money far above the actual cost of the telescope, don’t think of computers as any kind of instant gratification. Think of them as helpers to those who take the time to figure out how best to utilize them – just like a regular computer! We’ve added a great little product that is both art and science! Its the Remote Controlled Color Bug! The idea is simple, you have a remote control ladybug, as well as a simple controller that even a 4 year old can control. You also get a set of washable markers that you insert into the remote control ladybug! Then as the bug moves around it draws on the paper (you have to provide the paper). 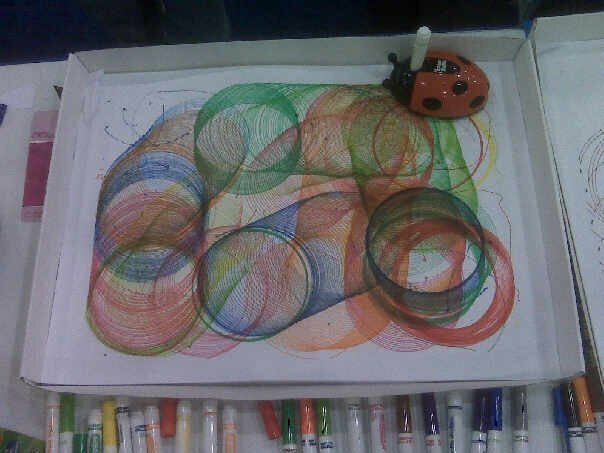 By steering it and making it do twists and turns you get all kinds of patterns from the marker. Change out the pen to a different color to make a multi-colored art piece! Here’s an example (courtesy of RCToys) of one very determined artists and her Color Bug! The color bug is just $19.95, which makes it less expensive than many remote control toys, and its a lot more fun for little kids. Designed for ages 4+! ScienceWiz has had a long tradition of making excellent science kits for kids. All of these kits were designed and authored by Penny Norman, PHD. We’ve been meaning to add parts of this line for some time and now it is in stock! This kit inlcudes a well-written full-color book plus the parts you need to do 18 different activities like lighting lights, buzzing buzzers, and spinning motors. This kit stands out not only due to its excellent design, but also because it is good for kids age 5-10. Most chemistry kits have a much higher minimum age. Awesome experiments like popping hydrogen and flame color tests make this kit stand out! Which involves solar racers, chain reactions, and much more! These kits are great for kids wanting to get a grasp on a particular subject! Thomas J. Johnson, Founder of Celestron, R.I.P. This has not been a good year for the founders of famous Optics companies. As you may recall, Norman Edmund, founder of Edmund Scientifics died back in January. Now we have been saddened to learn that Thomas J. Johnson, founder of Celestron Telescopes. Celestron Telescopes was founded in 1960 by Johnson who was able to make Schmidt Cassegrain telescopes at an affordable price. The company grew on this strength, starting with just a 6″ model but soon expanding to Schmidt Cassegrains that were as big as 22″ across. These Schmidt Cassagrains were generally lacking a corrector plate so Johnson and his engineers worked on a solution to properly manufacture the front collector plates. This led to the Celestron 8, which revolutionized amateur astronomy. Johnson sold Celestron in 1980 and the company has gone through several iterations since then. It is still privately owned and operates out of Torrance, CA.